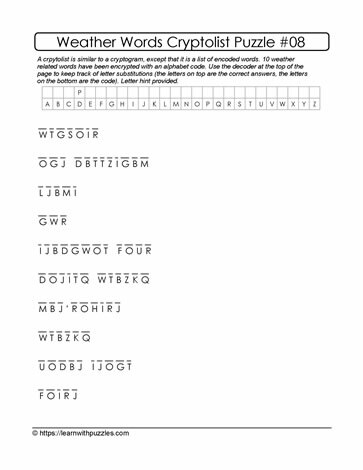 This weather themed cryptolist puzzle will challenge the brain, activate problem solving skills and create a sense of accomplishment when solved! Use the letter hint to jump start the letter substitutions. Combine knowledge of weather related words (weather, global warming, climate change), letter patterns and combinations, word structure patterns to decrypt the encoded crypto-family of words. These puzzles suit home schooling wishing to engage learners in challenge activities, helping to consolidate understanding of language structure, help build vocabulary and make connections among topics. Also suitable for students learning about weather in the middle school grades. Provide challenges to grade 9 to grade 12 classrooms wishing to augment problem solving strategy development.